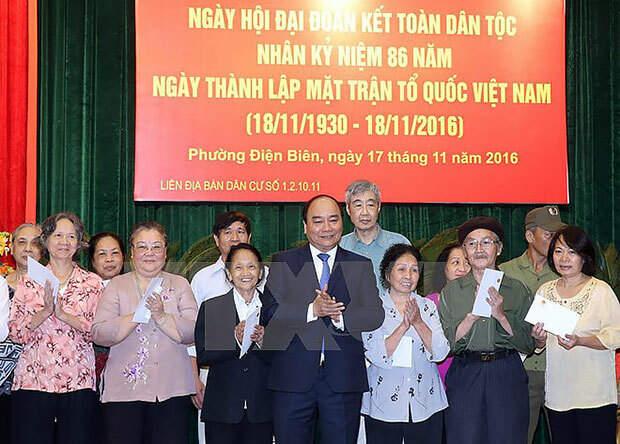 Prime Minister Nguyen Xuan Phuc on November 17 joined residents in Dien Bien ward, Hanoi’s Ba Dinh district, at the great national unity festival, which was held on the occasion of the 86th anniversary of the Vietnam Fatherland Front (VFF) (November 18). Addressing the event, the PM praised the VFF chapter in Dien Bien, local authorities and officials for regularly organising the festival, which, he said, offers an opportunity to review the development of the Vietnam National United Front – the VFF’s predecessor. Applauding outcomes of unity movements launched in Hanoi and Dien Bien in particular, the leader noted his wish that the VFF chapter and locals will carry forward such achievements while contributing their opinions on Party building and State management. On this occasion, Prime Minister Nguyen Xuan Phuc, Minister-Chairman of the Government Office Mai Tien Dung and leaders of ministries, agencies and the municipal People’s Committee presented gifts to disadvantaged households, individuals and students in Dien Bien ward. The same day, Vice Chairwoman of the National Assembly Tong Thi Phong attended the great unity festival in residential area No. 10, Thuy Khue ward, Hanoi’s Tay Ho district. Founded by the Communist Party of Vietnam and then President Ho Chi Minh on November 18, 1930, the VFF, under different names, has brought into play Vietnam’s traditional unity and patriotism and gathered people from all strata to defeat invaders and retake national independence./.